More than 800 people packed Cowley College’s W.S. Scott Auditorium on Thursday, October 27 for the third Annual DodgeBallalah – Battle Royal as part of this year’s Arkalalah Festivities. Globo Gym defeated the Cowley “Has Beens” in the final match to be named this year’s champions. Along with the title, they selected Big Brothers Big Sisters as the chosen charity to receive the $250 donation sponsored by local business, LiftCo Manlift. LiftCo is owned and operated by Terry Ramsey and Toby Furnas. 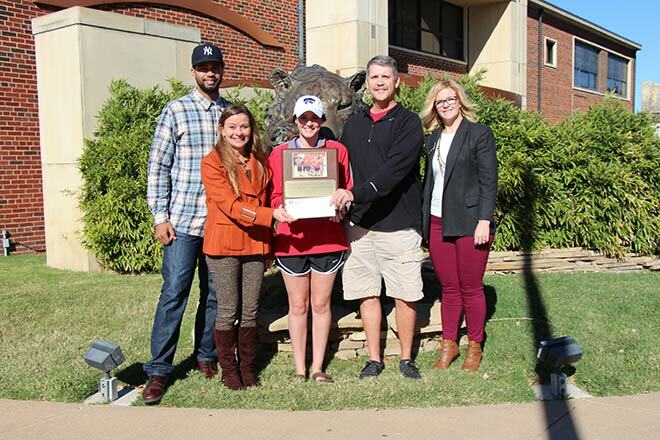 Pictured, from left, Cowley College intramural coordinator/dorm manager Gavin Brown, Community Manager of Kansas Big Brothers Big Sisters Debi Clark, Cowley student and team captain of the championship team Globo Gym Krystyn Kinzie, owner and operator of LiftCo Terry Ramsey, and Cowley College director of marketing Abby Hollins.